Simple tool to extract favorites / URLs from AOL Personal Filing Cabinet (PFC) files. 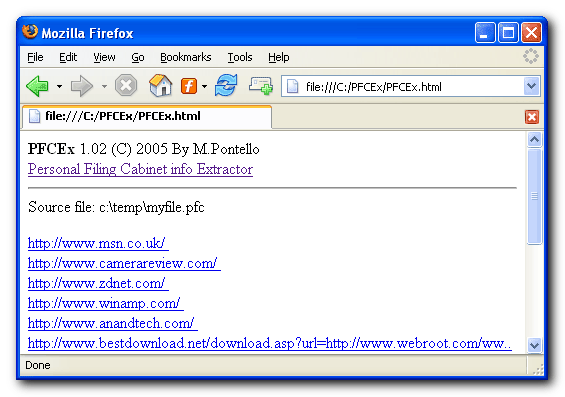 It generate a PFCEx.html file with all the URLs collected. Works also on corrupted PFC files, so it could be used as a rescue utility to recover favorites and other URLs! Extracted data written to file <PFCEx.html>. If you found PFCEx useful, you may consider a little donation! * Fixed a bug affecting the extraction of secure URLs. * Fixed command line parsing, regarding arguments with spaces or double quotes. * Small fix to the syntax of the resulting HTML file.